Zabetas is one of the warmest, relatable and talented Greek musicians of all time. His catchy, melodic songs, filled with the down to earth tragedy and comedy of the human condition that anyone could relate to, made his songs part of the DNA of Greek life. Everybody loves Zabetas. As one of the most recognized musicians in Greece he worked for many years in cinema with stars such as Aliki Vougiouklakai. He both appeared in films and wrote music for them, with songs such as “siko horepse syrtaki”. He claimed to have been influenced greatly by both Vamvaklaris and Tsitsanis, but his music is unmistakably his own and has it’s unique identity and place in Greek musical history.. In many of his songs he makes references to nightingales and swallows. Zabetas himself said that he loved to go and sit in the forests listening to nightingales. There singing gave him ideas for his melodies. 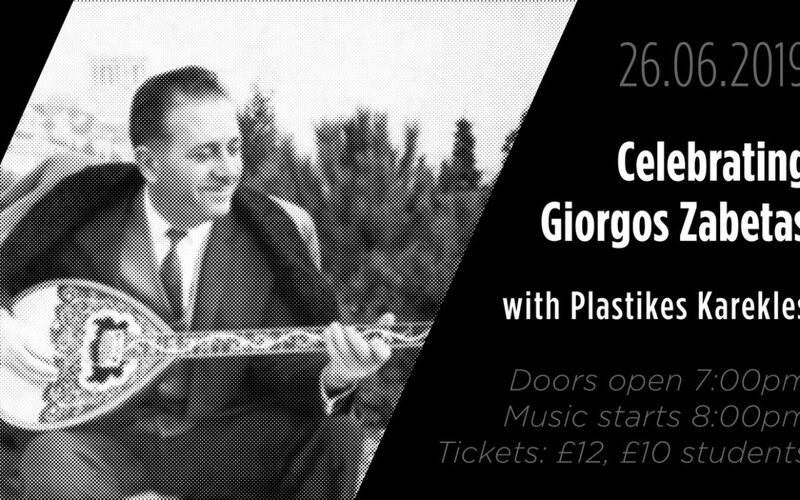 Plastikes Karekles are one of the foremost bands in the performance and cultivation of Greek music in the UK and abroad. Internationally they have performed at festivals in Greece, France, Italy, Scotland, Wales and Qatar. In the UK they have performed at Purcell Room, Royal Festival Hall, Royal Albert Hall, St David’s Hall as part of the Proms, as well as more intimate venues such as the Green Note, Vortex and the Forge, London. Most recently they took part in the Equator: Women of the World festival at Kings Place, London. The musicians of Plastikes Karekles are also the founding members of the Rebetiko Carnival, a charity and festival with Rebetiko music at its heart and dedicated to performance, outreach and education. They take music to schools, hospitals, prisons and care homes throughout the UK.